Shedding is vital to your snake's health and to his growth if he's a youngster. Knowing when he's about to shed gives you a chance to help make his shedding easier -- and it enables you to know it's time to leave the creature alone for a bit. Think of shedding as a process that goes through phases. Each phase has defining characteristics that show you how far along your pal is in the process. The shedding process starts with your snake's skin turning dull. It takes on a somewhat hazy appearance. During this phase, the change in skin appearance isn't always very noticeable. 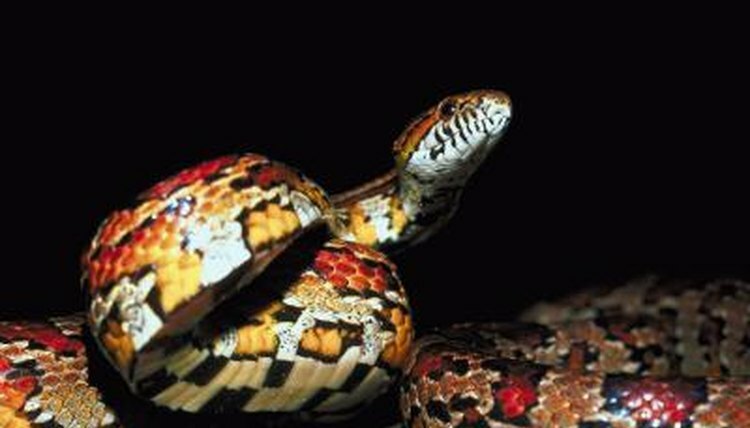 Some snakes experience only minor dulling of skin; others' skin loses its luster in only certain areas. Every snake is different -- even two snakes of the same species -- but you should notice some sort of change in the appearance of yours. When your snake's getting ready to shed, his eyes often foreshadow the change of skin that's about to occur. They'll turn a milky blue color, signifying the blue phase of the shedding process. During this time, your snake may seem frustrated and more aggressive because his vision is cloudy and he cannot see well. Do not attempt to handle him during this phase -- you'll only make him more aggravated. You'll notice his skin become much duller during this phase as well. After around two to four days of being stuck in the blue phase, your snake's skin and eyes will begin returning to normal. Don't worry -- you didn't miss the shedding of his skin. He's simply entered the final phase before that old skin sloughs off. After another two to four days, he'll likely start rubbing against the glass, his water dish, decorations and anything else he can to initiate the shedding. Once the skin starts coming off, it's a matter of minutes before his new skin is gleaming and the old is lying in a pile. If your snake does not shed his skin in one piece, the humidity level in his enclosure is likely too low. But an incomplete shed can indicate other problems, so take your pal to a reptile veterinarian to rule out serious health conditions. If humidity is the cause, research your snake's humidity preference -- every snake is different, so there's no one-size-fits-all here -- and adjust his humidity as necessary. Misting the inside of his enclosure more often and ensuring he has a full water dish will raise the humidity. The Doctors Foster and Smith website suggests misting tropical snakes directly with lukewarm water throughout the shedding process and placing damp paper towels or moss in a well-ventilated box to promote a healthy shed.